Join Metatron to launch their first all-American lineup of authors, travelling from New York City to be there for the official Montreal launch at the Drawn & Quarterly. Sarah Jean Grimm is a writer and publicist based in New York City. She is a founding editor of the online quarterly, Powder Keg. ‘Soft Focus’ won the 2016 Metatron Prize and is Sarah’s debut collection of poetry. Liz Bowen is a writer, scholar and editor living in New York City. She is a doctoral student in English and comparative literature at Columbia University, where she also teaches undergraduate writing. Her work focuses on 20th/21st-century American literature, disability studies, animal studies, post-humanism, and feminist and queer theory. Her poetry and essays have been published widely in literary magazines and anthologies. ‘Sugarblood’ is her debut poetry collection. Georgia Luna Smith Faust was born, raised, and currently lives in lower Manhattan where she presides over poetry and corporate bankruptcy administration. She is the author of the chapbook Too Faust Too Furious (Resolving Host, 2016) and the collaborative artist book, Pests of Public Importance (Purgatory Pie Press, 2016). She holds a BA in Literature and American Studies from Macalester College and an MFA in poetry from Brooklyn College. 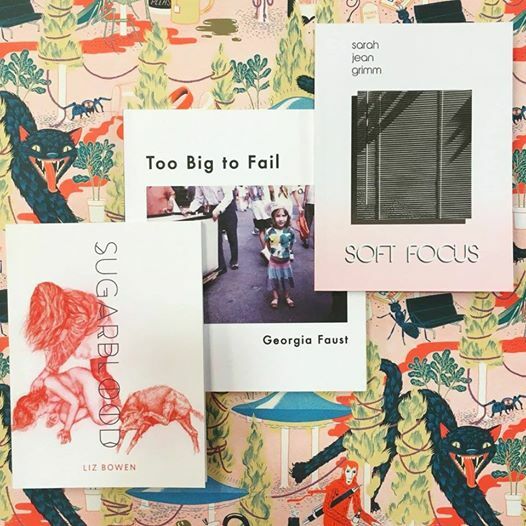 Too Big to Fail is Georgia’s debut full-length collection of poetry.